Owning your own washer and dryer is a real convenience compared to making frequent trips to the coin laundry. 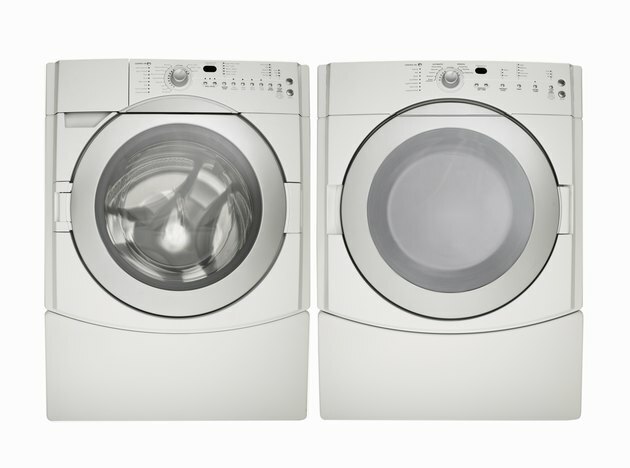 When your electric dryer stops working or malfunctions, you could be left with a whole washer full of wet clothes. But you might not have to make a trip to the laundry, hang the clothes on the line or call an appliance repairman. You can troubleshoot electric dryer problems and perhaps even repair the dryer yourself. Check that the electric dryer is securely plugged into the electrical outlet, if the dryer won't operate at all. Look for a blown fuse or tripped circuit breaker inside your house at the fuse box. Test the start switch on the dryer by pressing it to make sure you have power to the electric dryer. Look at the thermostats located underneath the top of the electric dryer if the dryer tumbles but won't produce heat. Remove the two screws that hold the top down. Put a circuit tester on the thermostat to make sure it is working. Follow the manufacturer's directions for use. Clean out the lint trap if the electric dryer takes too long to dry the clothes. The lint trap usually is located inside the dryer door or on top of the dryer. Pull it out, and clean the lint out. Also examine the vent hose for bends, kinks and proper air flow. The vent hose, which comes out of the back of the dryer, could be clogged with lint. Disconnect the hose by removing the clamp with a screwdriver, and clean the vent out. Test the motor if the electric dryer drum won't rotate. You can see the motor through the back of the dryer. Rotate it with your hand to see if it moves. Look at the drum belt and the idler pulley for signs of wear. The drum belt looks like a rubbery black belt. The belt wraps around the idler pulley and the drum. See if the belt is cracked or worn and needs to be replaced. Check the pulley for rust and free movement. Replace the bulb if the light doesn't work. The bulb is located inside the electric dryer above the dryer door. If the light still won't work after you replace the bulb, test the door switch located on the middle of the door. Hold the button in to see if the light works. Examine the electric dryer to make sure it is sitting level if it is running noisily. Use a level to determine if it is properly balanced. J. Taylor Ludwig holds a B.A. in business management and an M.A in media communications. She has worked as an investigative journalist and spent several years in the banking industry. Ludwig has been writing for more than 20 years and has published two nonfiction books.